Mint Condition. Comes with aftermarket box and BTW warranty. Case 44 mm, 18k Rose gold. Dial Brown dial features 30-minute counter at 3 o'clock, 12-hour counter at 6 o'clock, Tourbillon cage with seconds and date indicator at 11 o'clock. 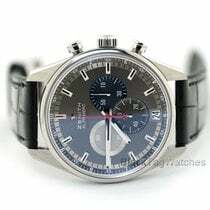 Movement Automatic Swiss made Zenith El Primero Caliber 4035 D, beats at 36,600 vph, 35 Jewels, 325 components & an approximate power reserve of 50 hours.